SCOTTISH Labour is supporting calls for a dedicated Shetland to Aberdeen cargo service to support the ongoing growth of the isles’ seafood sectors. 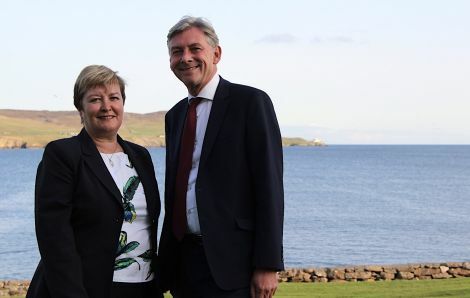 While on a visit to Shetland this week, Scottish Labour leader Richard Leonard also spoke out against a second Brexit referendum and said he expected a general election to be called should the UK crash out of Europe with no deal. Leonard, who was accompanied by Highlands and Islands list MSP Rhoda Grant, held talks with council convener Malcolm Bell and representatives from the fishing industry on Monday before meeting party members later the same day. Speaking to Shetland News on Monday afternoon, the leader of the second largest opposition party in the Scottish Parliament said his party would use the tendering process for the Northern Isles lifeline ferry service to press for more investment as well as a dedicated freight service. “At this stage, it seems to me, that there is an opportunity for the transport minister to make sure that the specification that goes into the tender includes a requirement for a dedicated freight service from Shetland, seven days a week,” he said. He said he was sympathetic to concerns expressed by the local fishing industry that growth expected as a result of coming out of the Common Fisheries Policy could be hampered by capacity constraints on the lifeline ferry service. The MSP for central Scotland added that the party was also supporting the council’s demand for more Scottish Government investment in the inter-island ferry service. Leonard added that he campaigned and voted against leaving the EU, but he said that it was important to recognise the result accordingly. “The job of elected representatives is to try and secure the best deal for people from the European Union,” the Scottish Labour leader said. “For us that means close continued alignment with the EU. We want to retain the customs union with the EU, and we want to see a fair immigration policy, which allows for freedom of movement of people. “There is a distinctive labour agenda for Brexit that we want to see enacted. And if the UK government doesn’t meet up to those tests that we set we will not vote for the deal when it comes back. He said he was against a second Brexit referendum as referenda had a role to play on matters of principle, but should not be used to vote on details or an outcome. Leonard acknowledged that Scottish Labour played a relatively low profile in local politics and pledged to change that by giving the party “a distinctive islands narrative”. “Going into the 2021 Scottish Parliament election I think we should have a distinctive manifesto for the island communities,” he said. He added that whilst the party was unlikely to win the constituency at the next election, he was nevertheless confident that Labour could increase the number of list MSPs for the Highlands and Islands from two to three.